For the past 50 years, any serious candidate for President of the 'United' States of America has had to basically camp out with the 'good folks of Iowa' and sip tea with the 'good folks of New Hampshire' for days, weeks and months on end in sub-zero freezing temperatures. If we are truly the 'United' States of America, not the 'Black or White America' President Obama so eloquently spoke of long, long ago in a galaxy far, far away now it seems, then why do two of the least populated states get to make this humongous, momentous decision every 4 years for the rest of us? On top of that, the demographics of Iowa and New Hampshire harken back to the good olden days where America was a predominately white WASPY society where Ward and June Cleaver raised two rambunctious son in a bucolic, tree-lined neighborhood in Everytown, USA. Iowa has a less than 3% African-American population and New Hampshire, well, good grief! Let's just say New Hampshire is 99% not African-American. Don't you think that maybe perhaps there is at least some tiny degree of probability that there is some other state out of 48 of them that might be just a teeny-tiny bit more 'representative' of the entire US population here in the 21st century? 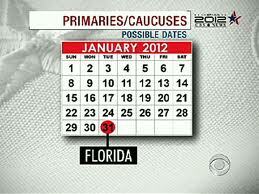 Florida just decided to move their primary up to January 31, 2012. Good for them. Instead of waiting for the results of the Iowa Caucuses on Februrary 6 and then the NH primary the second Tuesday in March, they have just decided to jump the field and bring one of the largest states in the Union into prominence before the die is cast for the most part by remaining the 4th primary just behind South Carolina. Here's a common-sense solution: Why not just rotate the presidential primaries around all 50 states so that each state has a chance to be in the top 5 every 4 years to pick our next presidential candidates from both major parties? The order for the top 5 every 4 years could be determined by a random ping-pong ball being chosen. Heck! we choose the NBA #1 draft picks that way and people become mega-millionaires every night when some state holds their lottery number picks on television. Why not set our state's ranking order the same way to choose our Very Most Important Person every four years? Otherwise, we would argue for a return to the days of smoke-filled rooms (although nowadays it would probably be the 'non-lethal' vapors of electronic cigarettes) at our national conventions where guys like Abraham Lincoln and FDR were chosen before the primary system took root in the early 1950's. Whatever we did before 1952 seemed to work, didn't it? For the most part? The current presidential primary system has deteriorated into an ESPN-esque, cartoonish version of democracy where candidates can't say what they really feel or want to do for the nation. When they do, they get mercilessly ripped to pieces by people in the media that none of us would ever vote for to represent us in the local PTA at our local school. Seriously....can you even imagine listening to Chris Matthews in a PTA meeting? You would never be able to say anything! Support the Florida Move to January 31. Maybe it will crack apart this archaic sclerotic primary selection process we now tolerate. It's a horrible idea -- randomness is never a solution to anything. "Clusters" mean that a handful of leftist states can sometimes put in a total socialist that would make Obama look like Reagan. Our electoral college system in its original form was ingenious, and political insanity like this is why I thank God for the founders -- people today are too dumbed down and irrational to make a document as brilliant as the constitution. My opinion: I think states should adopt laws resolving to have their primary on the same day as the earliest other state, with a reasonable fallback date (say, a couple months before the general election). That way you are guaranteed to at least share the first primary election, and thus reap the benefits of campaign spending. If the parties want to cut your delegates, fine... but after half the states have an identical rule, it'll start looking pretty silly. Once all states have said rule, we can get back to a primary system which is not so far removed from the general election as to seem totally independent, _and_ fix the whole game of leapfrog at the same time. Moreover, maybe we can get away from the whole "early disproportionate influence" thing, and possibly even reduce the popularity contest aspect of elections (since candidates would not be able to blanket all the states at once). So, a win-win-win. Read the Constitution and some history before getting all hysterical about the end of western civilization as we know it. There is nothing, nada, zippo in it about 'presidential primaries' behind mandated to be held in NH and Iowa first. in fact, there is no mention of primaries or conventions or political parties for that matter either. The primary system has only been used since 1952. Each state deserves a chance to be in the top 5 states every four years that 'matter'. start alphabetically if you want to: Alaska, Arkansas, Alabama, Arizona and California for 2012. Pull ping-pong balls out of the hopper for each and assign them the order they came out of the hopper as to where they will line up in the 2012 primary starting no sooner than May, 2012.
and then, they go to the bottom of the list and the next five get pulled for 2016. Those 5 randomly chosen states give a much better cross-section of America than letting the small states of Iowa and then NH determine who our next President will be almost always.